RANCHO SANTA FE — The summer of 2017 is teeing up to be a memorable one for Tony Perez. 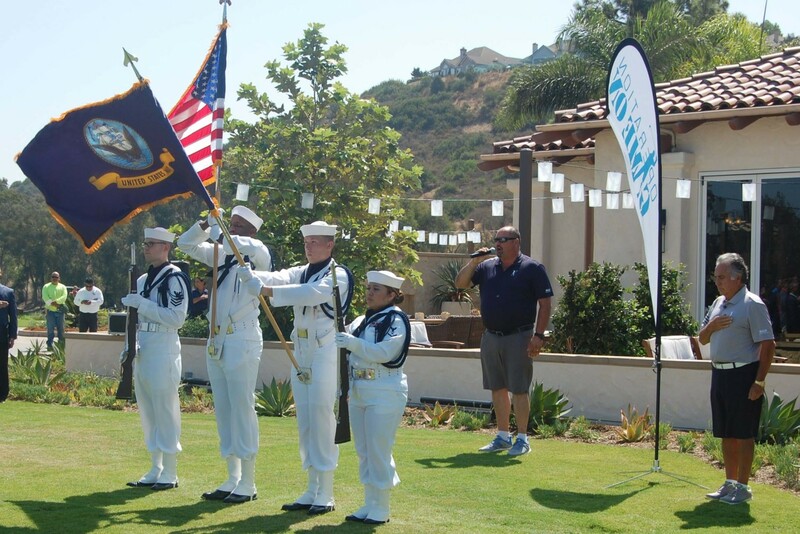 Operation Game On, the program he created that uses golf to help our nation’s servicemen and servicewomen transition from military life, held its 10th annual tournament Aug. 14 at Fairbanks Ranch Country Club. The event once again sold out and included 20 troops playing with sponsors, supporters, family and friends. Operation Game On founder Tony Perez, right, looks on as Del Mar Golf Center instructor Chris Lesson sings the national anthem. The USS Carl Vinson Color Guard includes Joshua Biddinger, Theron Goodson, Benjamin Nelson and Kristha Douglas. The opening ceremonies, which included the presentation of colors by the Color Guard from the USS Carl Vinson, the national anthem sung by Del Mar Golf Center instructor Chris Lesson and Greg Kaput playing “Taps” to honor those “who have given their lives so we can enjoy our freedom,” concluded with a surprise and honor for Perez. He received the 10News Leadership Award, which recognizes people who stand up for those who need help, initiate or create solutions for others, are role models and fulfill a local need to improve the quality of life for San Diegans. Susan Horvitz, Perez’s partner of 23 years, nominated him for the award a while ago. She said she had actually forgotten about it until she got the call that he was selected. Luckily, she said, she was able to keep the secret until the tournament. “This is a great honor,” Perez said. Operation Game On is available to all troops undergoing treatment at Naval Medical Center San Diego and Naval Hospital Camp Pendleton. Since 2008 Perez has expanded the program to spouses of wounded warriors and added lessons exclusively for female veterans. Experts have found golf is an essential link to the rehabilitation process for combat-wounded military personnel with extreme physical and mental disabilities. The tournament, which this year raised about $120,000, provides funding for participants, who receive 16 weeks of golf lessons by PGA-certified instructors, a fitting session at TaylorMade’s The Kingdom, a new set of clubs, a golf bag and golf apparel. To say the program has changed lives would be an understatement. “It’s a great experience,” said Marine Corps veteran Abraham Perez, who completed the program in May and was playing in his first Operation Game On tournament. “You take something you weren’t able to do and Tony has the tool set to make it happen and I appreciate that. This was his seventh Operation Game On tournament. “There’s not a truer American out there,” he said of Perez. The program has allowed retired Marine Corps Col. Jim Collins to return to a game he loved before losing a leg to a shrapnel infection that resulted from a Vietnam War injury. He’s been playing in the tournament since 2013. “I have fun,” he said. Retired Maj. Doug Cullins credits Perez for helping him transition from the Marines to the University of San Diego, where he is a second-year law student. 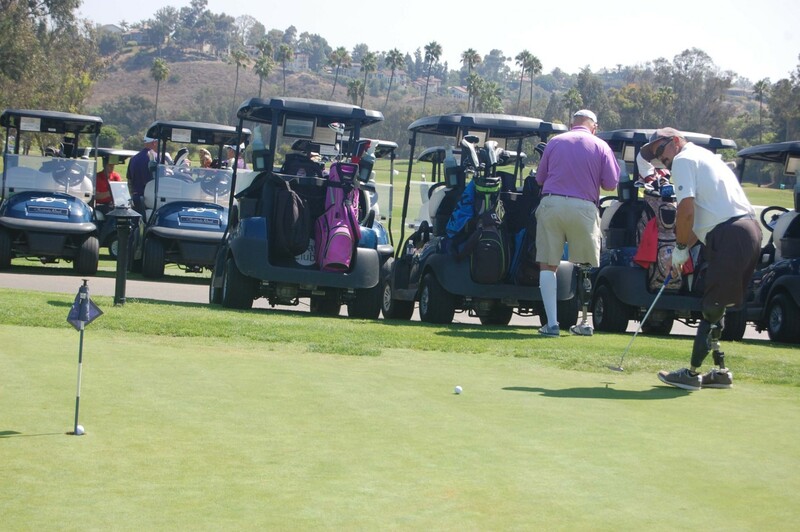 The tournament included food and beverages throughout the day along the course and ended with cocktails, a dinner buffet, a silent auction, a raffle and awards. The winners were Mike Perez, Paul Drolson, Gerry Monkhouse and Scott Ahern. With the 10th annual tournament behind him, Perez will now turn some of his focus to planning his wedding. About a month earlier he proposed to Horvitz. “After all these years she never asked me so I thought it was time,” he said.